This artist holds magic in his pen. A story writer, a lyric writer – a proud one from the Telugu Film industry’s birthday falls today. With many movies to his credit, he stepped into the film industry in the early 1950’s. His style of writing always established a good ‘connect’ with his audience. His audience would think and absorb the kind of messages he is trying to convey through his songs. Fondly known as Acharya Atreya, this Telugu lyric writer is also bestowed with the honour of a Doctorate Degree by Dr. B.R. Ambedkar Open University of Hyderabad for his immense contribution to the Telugu literature. A wonderful song that strikes us while talking about his wonderful contributions is the song ‘Priyathma’ from the movie Prema. ‘Swathi Muthiyam’ ofcourse was a famous one with many songs from the music album becoming famous. ‘Chinnari Ponneri’ and ‘Rama Kanavemira’ is ofcourse one of the best and the most apt ones amongst them. 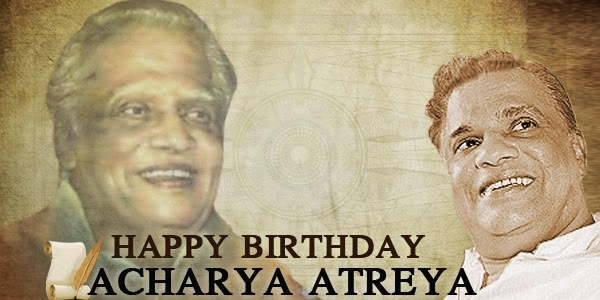 Acharya Atreya did not restrict himself with writing just songs. He was infact a part of the Venkatagiri Amateurs stage group and wrote many a plays for them. His interest just did not involve writing for the movie but he also constantly kept himself well- aware of the famous historical incidents around the world. He has even written about Gautama Buddha. Culture , religion , history etc too were other subjects he focused on. Infact this man also had a strong curiosity to direct one film which he went ahead and followed. The movie was called Vagdanam and was released in the year 1961. The movie was accepted pretty well in the industry too. The amazing writer contributed in many ways for the betterment of the Indian Film Industry. It is such an honour to have had a person of such great geniuses as a part of us.